The HP 4142B provides eight slots for a variety of plug-in measurement units. Reduce startup costs by customizing the HP 4142B for your application. As your needs increase, simply add more units. As you move from benchtop to production, easily migrate your tests by adding a compatible wafer prober, switching matrix, capacitance meter, and system software. 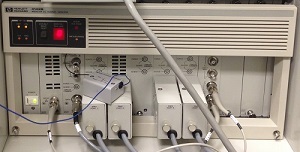 For general purpose DC or pulsed measurements, use the HP 4142B Source Monitor Units (SMU). The equivalent of four instruments, these precision modules force voltage while measuring currents down to 2OfA. Or force current and simultaneously monitor voltages down to 4O microV. The HP 41421B SMU conserves space (1 slot) by limiting ranges to +/- 1OOV and +/- 1OOmA. The HP 41420A (2 slots) extends the range to +/- 200V and +/- 1A. The HP 4142B is in import part of the 4062UX Parametric Tester. BRL Test is your parametric tester headquarters. We are 4062UX experts for sales and repairs.